The most commonly seen bees in Washington are the honeybee and bumblebee. Bees feed on pollen and nectar, and their foraging activity help ensure the pollination of flowering plants. Bumblebees in Washington State come in 24 varieties of colors and various sizes, but are always fuzzy in appearance. Bees have robust and fuzzy bodies compared with wasps, which serve to enhance their pollen gathering. Honeybees live in colonies that nest in crevices of large trees or other protected areas. Unlike honeybees, bumblebees establish new colonies each spring. They prefer to build their nest in abandoned mice burrows, small cavities in building walls, or other similar spaces. Both the honeybee and bumblebee can sting and will aggressively defend their colony. While foraging, bees are passive and rarely sting unless severely provoked. A honeybee stings just once. Their strongly barbed stinger lodges in the skin, then tears from the bee’s body when it flies away which causes the bee to die shortly afterward. The bumblebee’s stinger however lacks barbs, so it can sting repeatedly! I hope that you all are enjoying our beautiful summer weather. It’s the time of year that many of us just can’t stay indoors! The bees in our area seem to be doing very well this year. The blue orchard mason bees have done their pollinating, laid their eggs, and are through for the year. The leaf cutter bees are now busy filling in and taking over the yard. I am fortunate to have so many pollinators visiting my yard, maybe they liked the mild winter we experienced this year? It just seems like there are more buzzing bees of all types than usual out there. Possibly part of the reason may be that my neighbors and I are using less, if any, insecticides this year. I can only hope so! As I have noted before, one of every three bites of food we eat is from a crop pollinated by pollinators, including bees. Yet, over the past decade, we have witnessed an alarming decline in bee populations across the world. During this time, there have been dozens of scientific studies linking bee declines partially to pesticide use. These studies have illustrated the devastating effects that toxic chemicals are having not just on honey bees, but also on native bees and other beneficial insects. Even though the European Union has taken action and implemented a ban on the use of certain pesticides, the USA has not. I’ve read that just this year; Lowes announced they would no longer be selling plants and plant seeds that have been “soaked” in these harmful insecticides. However, Home Depot and Walmart, to name a few, continue to do just that with no warning to their customers. They continue to sell plants, including veggies that include these pesticides! Please, let us all stand up for beneficials. Ask your nursery if their plants contain insecticides and if they say they “don’t know” write to the company’s home office or their suppliers and ask. Tell your nurseries that their continued use of pesticides not only affects the good “bugs” but can also find its way into your garden and your drinking water as well. If you have children at home and do not purchase organic foods, ask your physician to measure the level of toxins in your children’s urine. New studies are showing high rates of toxins in our children. While some studies a couple of years ago showed no difference in nutritional values of pesticide covered fruits and vegetables, it isn’t nutrition that’s the issue, it’s the poisons we ingest! Ask yourself, would you give your child a teaspoon of insecticide a day along with their vitamins? 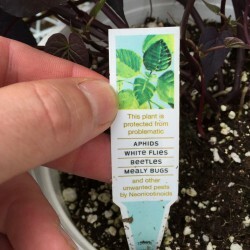 It’s great that some folks advocate against the use of insecticides, but if you don’t know the plants you buy already have them, you won’t know that you are actually using the insecticide as well. If you plan on buying plants at the nursery for feeding bees and other pollinators, or yourself and your family, take a few precautions to verify that your plants have not been treated with neonicotinoid pesticides. If this class of pesticide is persistent in the plant, or in the soil around the plant, it can continue to kill pollinators for several years after planting and it isn’t doing your body any good either! Enjoy being in your garden this summer, maintain a bee-safe yard, try not to use pesticides, especially insecticides in the garden and NEVER on flowering plants! All the pollinators and I thank you! COGC is Ready for Green Scene 2018! Green Scene 2018 this Weekend!